'The Day of the Visit' - The Horti Sallustiani - (Gardens of Sallust) were Roman gardens developed by the Roman historian Sallust in the 1st century BC. The landscaped pleasure gardens occupied a large area in the north-western sector of Rome, in what would become Region VI, between the Pincian and Quirinal hills, near the Via Salaria and later Porta Salaria. The property originally belonged to Julius Caesar as the 'Horti Caesaris', but after his death it was acquired by the historian, Sallust, who developed it. After the writer's great-nephew it passed to Tiberius in 20 AD and was maintained for several centuries by the Roman Emperors. The gardens were enriched with many additional structures and contained many pavilions, a temple to Venus, a porticus of a thousand paces, and monumental sculptures including the Borghese Vase, the Dying Gaul and the 'Obelisco Sallustiano', a Roman copy of an Egyptian obelisk. 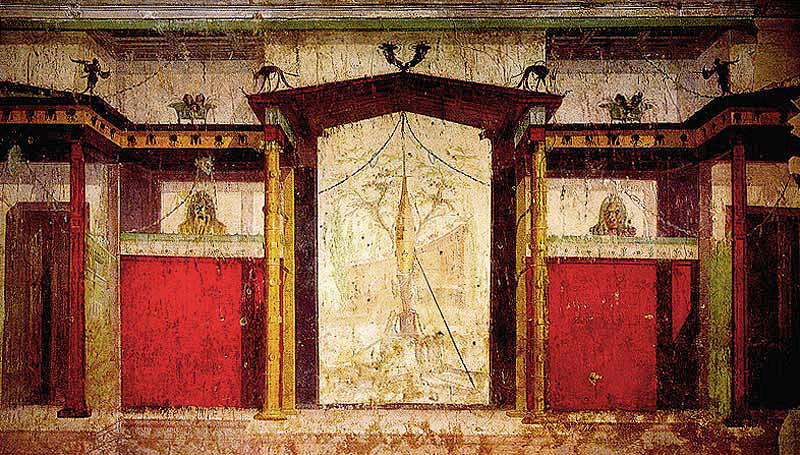 Vespasian, a man of relatively simple tastes, had no liking for Nero's 'Golden House', or the Domus Augustana on the Palatine Hill, and preferred the tranquillity of the Horti Sallustiani. The House of Augustus - After being awarded tribunica potestas for life in 23 BC, Octavian decided to buy the house of Quintus Hortensius on the Palatine and made it his primary place of residence. The comparative modesty of the Domus Augusti was in keeping with the return to traditional ideals promoted during the Augustan period. The 'Domus Augusti' was located near the 'Hut of Romulus', and other sacred sites which relate to the foundation of Rome. This residence contained two levels, each leading to a garden courtyard. So it was to the Horti Sallustiani that Marcus went to meet the Emperor. Ahead of them went a large wagon bearing some gifts, and in particular a magnificent gilded bronze tripod. As outriders to the carriage rode Marcus and Petronius, on large stallions, and following came their personal slaves, including, of course, Adonios and Glaux - who was very interested in all the sights of Rome on the way. The whole procession (for that was what it was), was escorted by a group of Praetorians, who had been sent by Titus in order to ensure that the way was made clear. It was Marcus Cocceius Nerva who came to the gates of the Horti Sallustiani to greet Vespasian's guest - and as usual, Petronius was mistaken for Marcus, as Nerva had never met Marcus before. Once the gifts for Vespasian had been unloaded and deposited in the foyer, Marcus, along with his entourage entered the atrium of Vespasian's pavilion. Contrary to expectations Vespasian was not seated, enthroned as the ruler of the greatest Empire in the world, but was seated on a couch, like any well to do Roman patrician, beside a very slim and elegant middle aged woman. 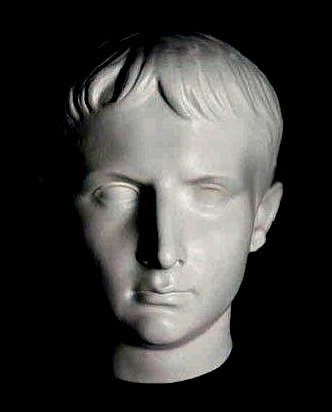 Standing behind him was the easily recognisable figure of Vespasian' amiable eldest son, Titus. The only thing that marked Vespasian out as emperor was his robe of imperial purple, embroidered with heavy gold brocade. "So at last we meet, Marcus Octavianus Gracchhus of the House of the Jullii." - Vespasian said, rising from his couch and coming forward to take Marcus hand. It would have been normal for Vespasian, as Emperor, to remain seated as Marcus approached him, but Vespasian was not one to stand on ceremony, particularly with someone for whom he already had respect. "And I have heard so much about you, particularly from my son, Titus - but you are so young !" "And you are the one who makes and breaks Emperors...with ingots of gold, and a seal ring." Vespasian continued playfully, smiling but looking closely into Marcus' eyes. "I think that you refer to my esteemed and 'late' adoptive father - Gnaeus Octavian Gracchus. ", Marcus replied modestly. "Well regardless, as long as you don't 'break me' you are a friend of the Flavians. ", Vespasian continued, looking back at the elegant lady, who was still seated demurely on the couch. "And rumour has it that you are favoured of the Gods, and in particular Augustus' patron the great Apollo. But then here we are - both alive and well, so perhaps the Gods favour both of us. 'Enter Caenis' - "But I forget myself. May I introduce Antonia Caenis. ", Vespasian said. Marcus, not realizing that Vespasian had a 'wife', was a little taken aback, but immediately bowed, and offered his hand. "So you are the young Marcus of whom Titus speaks so well". Caenis said in eloquent Latin. 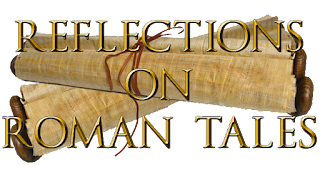 "I think Titus Vespasianus exaggerates... Dominae meae." ("my Lady"), Marcus replied, - and for the first time ever, Aurarius noticed that his master was blushing. "And I think that you and I may have much in common.....", Caenis added, mysteriously. At that point Marcus though it best to overlook Antonia Caenis' strange comment. "And I also forget myself, Dominus, so let me introduce my staff." At that point Marcus associates - or should that rather be close friends - line up to be introduced to their Emperor. "This is my Summus Angliae Seneschallus (High Steward), Terentius." - and Terentius bowed deferentially. And this is my Summus Consiliarius (Chief Counsellor), Novius." - and Terentius bowed deferentially. "And this is my Tribune, Petronius." - and Petronius bowed deferentially. "The young man is my heir - Demetrius. ", - and Demetrius - duly surprised at being publicly announced to the Emperor as Marcus' heir, bowed deferentially. "And the boy with the bird ? ", Vespasian asked - and Marcus was terrified that Adonios would 'tell off' Vespasian about calling Glaux a 'bird', and go into a long explanation about Glaux. 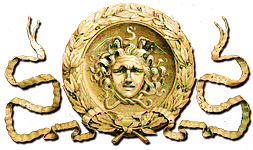 "The boy, father, is Adonios, a particularly favoured slave-boy, who belongs to Petronius, and the bird is 'Glaux', a gift, according to Adonios, from the Goddess Athena - the sister of Apollo - and Glaux it seems is the guardian, talisman and palladium of the House of Gracchus." "I see....", Vespasian said, smiling. "So I must show some respect to this fluffy little chap ! ", Vespasian said, stepping forward to get a good look at Glaux. "And I thought I had seen everything when I was in Egypt ! ", Vespasian said, shaking his head in wonderment. Glaux, contrary to court etiquette, looked squarely at Vespasian, and then blinked. "I think he'd like to sit on your shoulder, Dominus. ", Adonios piped up, addressing Vespasian (which he was not supposed to do), and Marcus simply felt that he wanted to sink into the marble floor, and disappear. "So.... why not ?" Vespasian replied, and Titus smiled, knowing that now all would go well. Adonios lifted Glaux up, and the bold owl daintily stepped onto the shoulder of the Roman Emperor - and then cuddled up to his cheek and nibbled his ear. "He likes you, Dominus. ", Adonios said - speaking once again without permission, and contrary to the instructions that Petronius had given him - but Petronius, predictably, was not concerned in the slightest. "Well then, perhaps he will have a chat with Apollo, and let me go on being Emperor for a few more years. 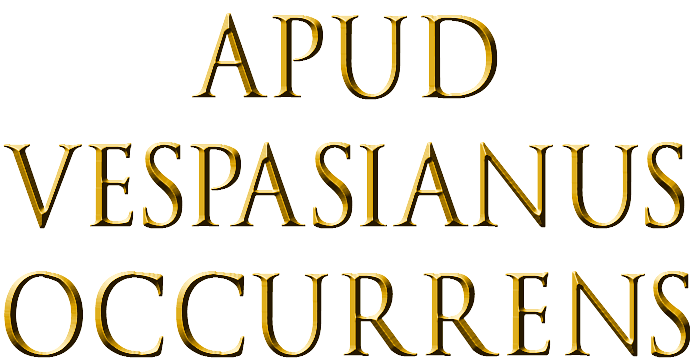 ", Vespasian quipped. "I'm sure that he will. ", Petronius said quietly. By now, everyone had relaxed as Glaux had once again 'broken the ice'. "So Marcus will you come and eat with us ? ", Vespasian asked, partly breaking the spell that Glaux had so carefully woven. At Petronius' suggestion Adonios carefully lifted Glaux from Vespasian's shoulder, while Antonia Caenis rose elegantly from the couch. "It's about time, my love...leaving our guests to starve. ", she said to Vespasian, sweeping past her husband, who was still fascinated with the little owl, who had by then settled on Adonios' hand. Aurarius and Euphrainus, making a handsome pair, followed Marcus and Antonia Caenis. Vespasian, surprisingly accompanied by Adonios and Aniketos - with Petronius trailing behind, seemingly forgotten, followed Antonia Caenis and Marcus. Poor Aniketos thought he must be dreaming - accompanying the Emperor of Rome (who had just had an owl on his shoulder), and the boy imagined that, in reality, he was fast asleep in his tiny cubiculum in his previous master's villa. The remainder of the procession consisted of Titus, escorting Novius, and at the end Nerva. Almost immediately stewards and slaves provided seating for the guests, which took a while, as it was important for some guests to be sitting in the appropriate place, in order to engage in suitable table-talk. Caenis insisted that Marcus sat next to her - Novius was suitably seated next to Vespasian, as they had a certain interest in common in what we would now term the 'supernatural'. Terentius was seated beside Nerva, as they had matters of finance and politics to discus, and Petronius had Demetrius on one side (so that he could keep the lad amused, and keep an eye on him), and on the other side Titus had been placed, as he and Petronius had a shared interest in Ludi and Amphitheatres. Caenis turned to Marcus, as the first course was served. "As I said when we were introduced, I think that you and I may have much in common...", Caenis said, continuing her previous comment. Marcus was unsure of what she meant. "In what way ? ", Dominae meae, Marcus asked, intrigued. "And please, Marcus, don't call me Dominae meae. ", Caenis said forcefully. "My friends call me Caenis. ", she continued. "Well, Caenis, I didn't for a moment presume on your friendship, but I am honoured, and will from now on, call you Caenis. ", Marcus replied, politely. "Oh, my boy, - you are so formal - but so charming. You are now chatting to a friend - who hopes to become a good friend." Caenis said, putting her hand on Marcus' hand. She felt Marcus flinch, just slightly. "I feel.... that you have had some bad experiences...", she said, trying to draw Marcus out. "I think most of us have, but your hand on mine reminded me of my mother. ", Marcus replied, and then he immediately regretted being so open. "And I think that your mother is dead...", Caenis suggested. "Yes....how did you know ? 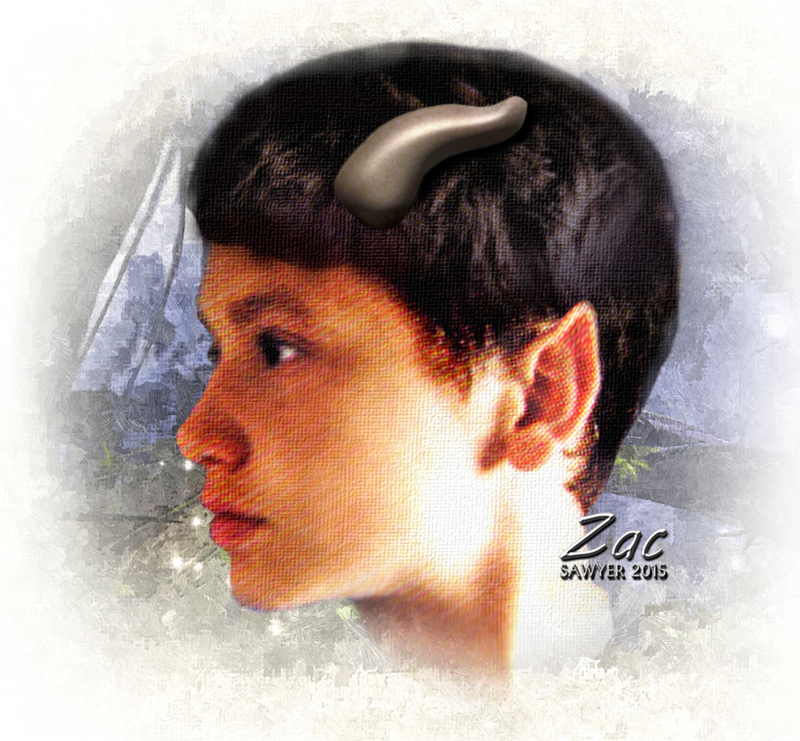 ", Marcus asked, nervous that he could be so easily read. "Just say that it's woman's intuition. ", Caenis said, smiling reassuringly. "But tell me why do your boys stand so far back ? Isn't it inconvenient to call them ? ", Caenis asked, changing the subject briefly, as she looked round at Aurarius and Euphrainus. They are trained to stay out of earshot in all situations. It's better for us - and better for them. Some things should remain private. ", Marcus explained. "That is wise. ", Caenis replied. "Well as we cannot be overheard, I will explain about what I said earlier. ", Caenis continued quietly and confidentially. "I said that we had some things in common, Marcus, because I happen to know that you were once a slave." Marcus looked at Caenis, surprised. "And as you may be able to tell from my name, I too was once a slave - a slave of Antonia Minor, the daughter of Marc Anthony. 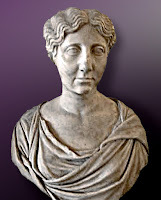 Antonia Caenis had been a slave of Antonia Minor, (daughter of Marcus Antonius - yes, the Mark Anthony), sister-in-law to the Emperor Tiberius, mother to the Emperor Claudius, and grandmother to the Emperor Caligula). Caenis had been a secretary (a female version of Terentius' Philipos), and was reputed to have a photographic memory - or whatever the expression would have been at that time. 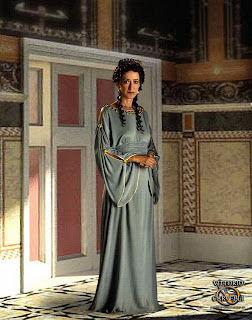 Even once she was freed on Antonia’s death, Caenis and Vespasian could never marry because of a law forbidding the union of senators and freed-women. For a number of years they separated, but then, after the death of Vespasian's wife - (the mother of Titus and Domitian), they came together again. (Domitian, [Titus' 'wobbly' brother], however, reused to recognise Caenis as a member of the family, despite the fact that Caenis was Empress in all but name). 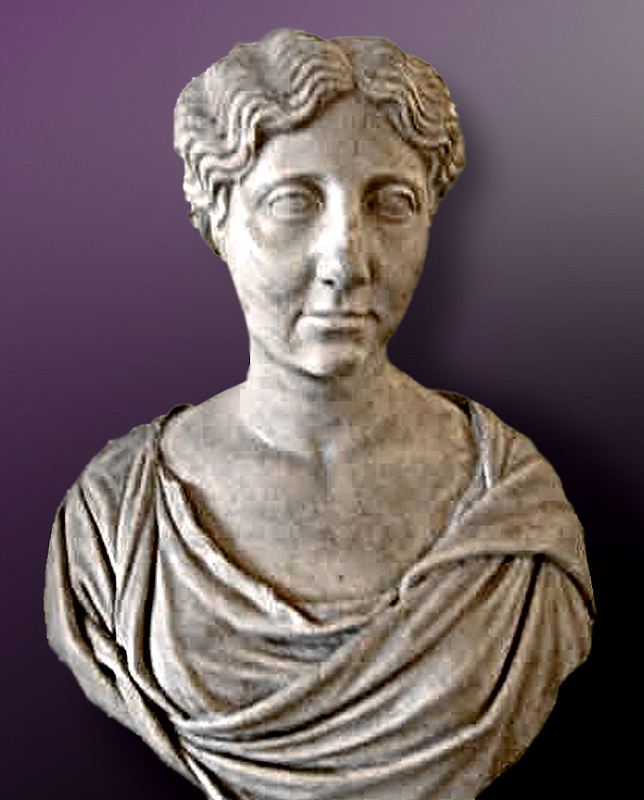 Antonia Caenis, as you may have guessed, became a close friend of Marcus until her death in AD 74. (and that is giving a lot away, because now you know that Marcus is still alive in AD 74). "I also know that your parents were killed by pirates, and you became a slave, and were sold to a fabulously wealthy senator, distantly related to the family of my former mistress. The rest, as they say, is history, or in your case, legend. ", Caenis paused. "You do know that you are a legend in your own time......? ", she said, leaving Marcus confused and embarrassed. "And how do you know all this ? ", Marcus spluttered. "It's simple, Marcus." Caenis replied, lightly. "Titus and I are very close. He's like the son I never had - but he is also Praetorian Prefect, and has spies and agents everywhere. He's the power behind my Vespasian - but he's charming, as you know - unlike his nasty little brother - who is far from charming." "I see..", Marcus replied, sinking back on his couch and taking a deep breath. "So.... we have both come from nothing, - and become something - so to speak." Caenis went on. "From the early days of the Republic, until only recently, the Empire, as you know, has been ruled by patricians - the descendants of the 'patres' appointed by Romulus - people who were always 'something'. 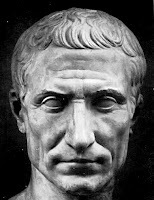 Now Marcsus - the time has come for ordinary people, like my Vespasian, and Titus and you yourself to guide the Empire. Ordinary people, from simple backgrounds, who know what is best for the millions of ordinary people in our great Empire. That is why Vespasian and Titus look to you for help." Marcus looked at Caenis - bemused. "But I have said too much - you must speak to Vespasian." Caenis said, reaching out for her goblet of wine. Vespasian, however, was deep in conversation with Novius. All this talk about dog-headed gods, and dusty old Egypt must be boring Novius here, and I think you should really pay some attention to your guest of honour. ", Caenis said, gently chiding the Emperor. Please excuse me for a moment, Novius. ", Vespasian replied, like any ordinary, henpecked husband. "So my boy - how do you like Caenis ? ", Vespasian asked proudly, as he turned to Marcus. 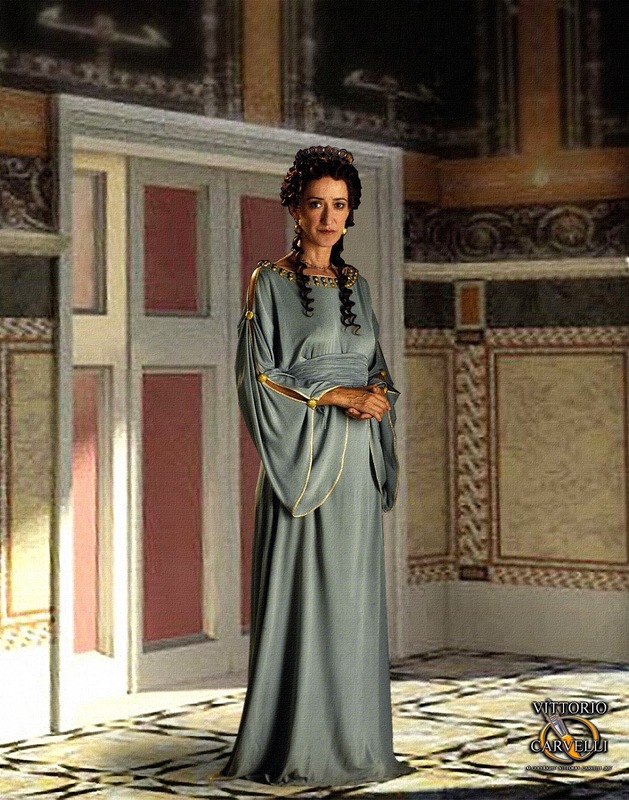 "She is very knowledgeable and astute, Dominus. ", Marcus replied, trying to be polite without being too flattering. "And I believe that you are getting on well with my eldest son, Titus. ", Vespasian continued. We get on very well. ", Marcus confirmed. "Yes...well it's a pity about young Domitian." Vespasian said , abstractly. "He wouldn't come tonight - although I did ask him. It's a problem between him and Caenis. ", Vespasian suggested, without really explaining anything. The main thing is that your man Terentius gets things sorted out with Nerva. Better that they deal with it than that we spoil a perfectly good meal with all that financial chatter." Vespasian continued airily. Caenis smiled knowingly, aware that while Vespasian needed (and loved) money, he preferred to leave the sordid details to his minions. "And your Terentius - has full authority in these matters ? ", Vespasian questioned. "Full authority, Dominus. ", Marcus assured Vespasian. "That's good. ", Vespasian said, patting Marcus' hand. "So tell me, my boy - how are you liking Rome ? ", Vespasian asked. "Well although I was born here, this is the first time I have visited as an adult. ", Marcus explained. "That's right...Titus told me that you grew up in Athens. Lucky you....a very beautiful city. I went there with Nero - but I'd rather not talk about that." Vespasian continued. "And how does Rome compare to Athens ? ", Vespasian then rather pointedly asked. "Well they're very different. ", Marcus replied, trying to be non-committal. "Indeed....too many philosophers in Athens ! ", Vespasian said grumpily. "Your're not one of those philosophers, are you ? ", Vespasian asked. "Not at all, Dominus." Marcus replied, quite truthfully. And so the evening continued - with much inconsequential talk, while Terentius and Nerva hammered out a mutually beneficial agreement behind the scenes. 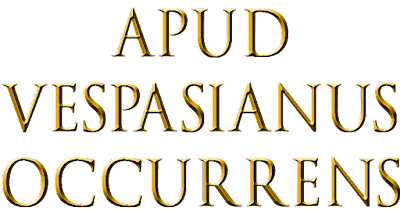 There were no dancing boys, or girls for that matter at this entertainment, as Vespasian seemed to be remarkably abstemious, despite the fact the Titus kept a 'harem' of pretty boys and eunuchs. Vespasian disapproved, but was loathe to make a problem, as he relied so heavily on his eldest son in matters both military and political. As the evening began to wind down, Marcus took the opportunity to present Vespasian with a Greek style gold Tripod - similar to the one he had presented to Titus. When the tripod was set before Vespasian he seemed quite overcome, and gave a little speech. "This is truly magnificent, Marcus my boy - and so much better than the one you gave to Titus (Vespasian said this giving an obvious wink to his much loved eldest son). I feel that it is truly a mark of favour from our newly found and dear friend.". Marcus bowed to express his thanks for the compliment. Vespasian then summoned one of his senior freedmen. The freedman handed Vespasian a scroll. "And this, my dear Marcus Octavianus Gracchus is a gift to you. This scroll is the Imperial Edict, bearing my Imperial Seal, creating you a member of the Roman Senate. ", Vespasian proudly announced as he handed the heavy scroll to Marcus. "Congratulations my boy !" and Vespasian offered Marcus an embrace, and a 'salutatio' - a formal Roman kiss. So... the evening has been remarkably successful. Terentius was happy with the financial deal he had made with Vespasian on behalf of Marcus, and Titus was pleased that his father approved of his new friend - and Caenis was happy to have a new friend of exceptionally high status who had similar experiences to her own - in other words, that Marcus had known the burden of slavery. For Vespasian, there was a certain sense of regret. After Marcus had left, and he and Caenis were alone, he made a significant admission to his long-term and dearly beloved mistress. "If only my youngest son had been more like Marcus....." he said, sadly. and the following morning preparations are made for the short journey to the villa at Tibur.